The excellent image quality that LSST will deliver will allow us to obtain morphological information for all the extended objects with sufficient signal-to-noise ratio, using parametric model fitting and non-parametric estimation of various morphology indices. The parametric models, when the PSF is properly accounted for, will produce measurements of the galaxy axial ratio, position angle and size. Possible models are a general Sersic model and more classical bulge and disk decomposition. In the case of an r1/4−law, the size corresponds to the bulge effective radius, while for an exponential disk, it is the disk scale-length. This process naturally produces a measurement of the object surface brightness, either central or median. An example of such a fit is shown in the above figure (Barrientos et al. 2004). The median seeing requirement of 0.7′′ corresponds to ∼ 4 kpc at z = 0.5, which is smaller than a typical L∗ galaxy scale-length. 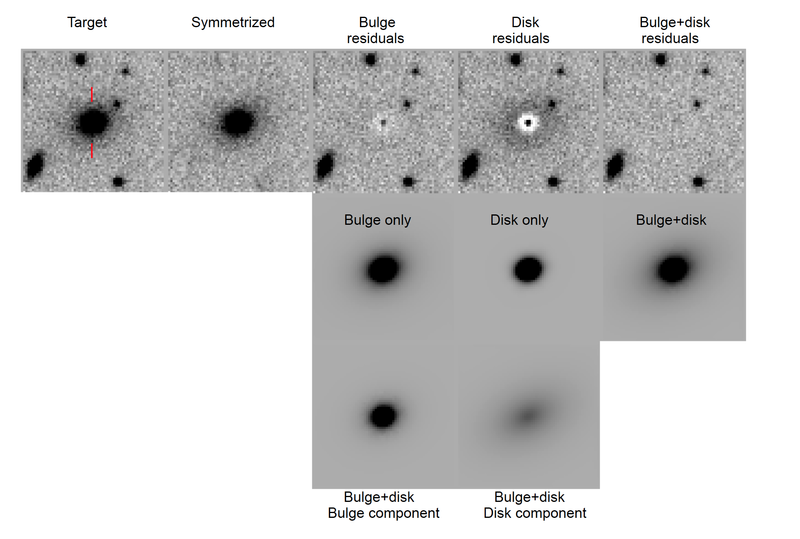 Therefore, parametric models will be able to discriminate between bulge or disk dominated galaxies up to z ∼ 0.5 − 0.6, and determine their sizes for the brightest ones. Non-parametric morphology indicators include concentration, asymmetry, and clumpiness (CAS; Conselice 2003) as well as measures of the distribution function of galaxy pixel flux values (the Gini coefficient) and moments of the galaxy image (M20; Lotz et al. 2004).